Sadly apple picking at my favorite farm has ended. Mom and I made a good showing this year, I think we went fruit picking at least twice a month since the farm opened in late spring. 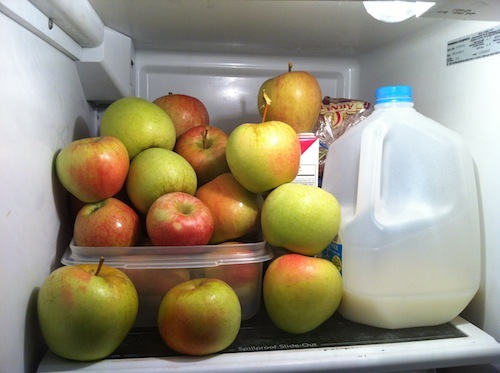 While I will miss the abundance of apples, it will be nice not to try and force 20 lbs of apples into the fridge and I can probably do with a break from apples for a little while (if you eat three apples a day do you keep the doctor away for an extra long time?). 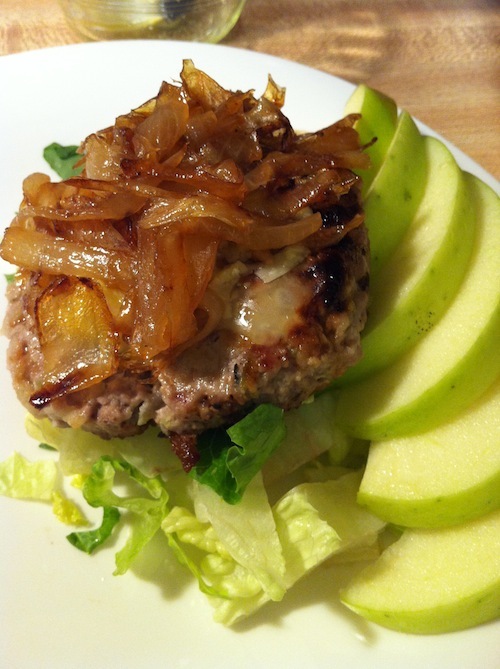 One of my favorite bloggers, Iowa Girl Eats, had this recipe for Orchard Turkey Burgers that sounded so intriguing. I’ve had it pinned since August, and just happened to pick up some ground turkey at the store and on the way home I knew this is what I had to make. It was delicious! I loved that it doesn’t need to be served on a bun. The apple in the burgers is subtle but keeps them super moist and tender. The extra-sharp cheddar contrasts with the caramelized onions to create a real flavor explosion! Definitely a keeper recipe! Heat large skillet over medium heat. When oil is hot, add sliced onions. Cook the onions slowly over medium-low heat, stirring occasionally. Season with salt to taste. Cook for about 20-25 minutes until golden brown and deliciously caramelized. Meanwhile, mix together turkey, grated apples, thyme, garlic and onion powder, sat and pepper. Divide mixture into 8 equal portions and form into patties. Lightly brush the outside of the patties with olive oil. Heat a large grill pan over medium-high heat. When pan is hot, add patties. Cook for about 2-3 minutes until golden, flip the burger and add cheddar cheese on top. Cook for another couple of minutes until browned on the bottom and cooked through. Serve over a bed of greens and top with caramelized onions.